Meijer is committed to buying locally grown product, and we're especially thrilled to offer the freshest quality poinsettias during the holidays. For over 50 years, Meijer has been working with West Michigan-based Masterpiece Flower Company to bring the freshest flowers to our customers. Meijer began its partnership with Byron Center, Mich.-based Masterpiece Flower Company more than 50 years ago. Today, Masterpiece delivers locally-grown potted plants – including poinsettias and orchids in the winter, and hanging baskets and Easter lilies in the spring – to each Meijer store twice a week, 52 weeks a year. Thanks to its longstanding partnership with Masterpiece Flower Company, Meijer will sell nearly enough Michigan-grown poinsettias to fill eight football fields, supplying each of its 223 stores across the Midwest with the beautiful potted plants. 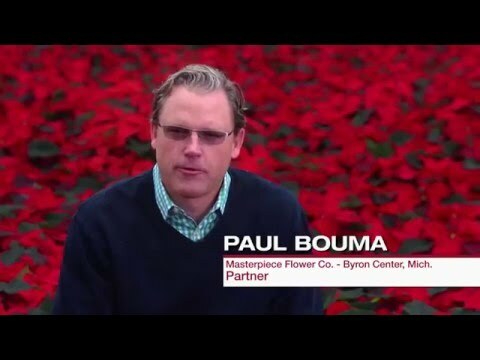 Byron Center, Mich.-based Masterpiece Flower Company will grow nearly enough poinsettias to fill eight football fields this holiday season to supply each Meijer store across the Midwest. The retailer’s partnership with Masterpiece began more than 50 years ago, and since then the grower has expanded its own operation over the years. Meijer is a strong supporter of local growers and businesses, and that commitment goes beyond the grocery and produce aisles. Thanks to its longstanding partnership with Masterpiece Flower Company, Meijer is continuing its tradition of supplying each of its 223 stores across the Midwest with beautiful locally-grown poinsettias this holiday season. Meijer carries a variety of poinsettias each holiday season thanks to its longstanding partnership with Byron Center, Mich.-based Masterpiece Flower Company. Masterpiece will grow nearly enough poinsettias to fill eight football fields for Meijer this year.